Jharkhand meaning "forest tract" is the ancient name given as a whole, to the forested upland geographically known as the Chotanagpur plateau forming the north-eastern portion of the Peninsular Plateau of India. It is a region of great unevenness consisting of a succession of plateaus, hills and valleys drained by several large rivers such as the Damodar, Subernarekha, Barakar, Brahmani and Baitarani. The plateau represent a vast area from the western most part of Bihar to the border of West Bengal in the east, and continues somewhat further into West Bengal. On the basis of physiographic consideration, this plateau can be further sub-divided into the Ranchi and Hazaribag plateau. Jharkhand is one of the richest areas in the whole country, rich in minerals deposit and forests. The region has huge reserve of coal, iron ore, mica, bauxite and limestones and considerable reserves of copper, chromite, asbestos, kyanite, china clay, manganese, dolomite, uranium etc. The value of minerals extracted in Jharkhand in 2004-2005 was Rs 5,760 crore- approximately eight per cent of the total value of mineral production of the country. The state is a larger producer of fuel minerals and accounts for 10 per cent of their total value in the country. Coal contributes the most -92-93 per cent- to the total revenues from mining received by the Jharkhand government, iron ore accounts for another two to three per cent. Jharkhand receives the maximum mining royalty among the coal-producing states of India. Since its formation, the Jharkhand government has been laying the red carpet for industrial investment by offering sops. The Jharkhand government has granted 524 leases for mining various major minerals-206 of which have been granted for coal alone. In addition, 2,717 leases covering an area of 8,426 ha have been granted for extracting minor minerals in the state. A significant portion of Jharkhand´s population, 44 per cent, is below the poverty line and more than six per cent is still unable to get sufficient food. The poverty ratio in the state is much higher than that of the country. In the name of national interest the Jharkhand area is witnessing a gigantic industrialization and development process for the exploitation of its natural and human resources. The working of Jharia, Bokaro and Karanpura coalfields started in the 1856. The opening of coal mining in Dhanbad area during the second half of the 19th century and the establishment of the Tata Iron and Steel company in Jamshedpur in Singhbhum district in 1907 marked the beginning of the large scale exploitation of mineral and other industrial resources in this area. The Jharkhand region an account of its richness in some key ores and minerals and its abundance in cheap labour, thanks to its backwardness, otherwise, has been the site of a good many industrial establishment since pre-Independence days and that industrialization has brought with it concomitant ill effects the worst of which is the devastation of its environment. In the name of the development large forests have disappeared, tracts of inhabited land have gone under water. Water in the region around industrial areas have been polluted to an extent far exceeding the prescribed safety level. In fact polluted water carried down the streams and rivers spreads mischief in distant areas also. Industrial pollution is already playing havoc with the life and health of the people of the region. The natural wealth of this area contrasts vividly with the desperate poverty of the people who inhabit it. This region has been far the ages and the homeland of aboriginal races such as the Mundas, Asurs, Santhals, Oraons, Ho, Kharias etc. These indigenous groups have been the worst hit by the large scale exploitation of the natural resources of the region through the development of mines, industries and commercial exploitation of forests. The majority of them live in a state of semi-starvation through out the year. For centuries the indigenous people of Jharkhand lived in harmonious relationship with their environment. They have developed a culture which is closely related to nature. Since their lives are closely related to nature, any adverse impact on the environment in which they live will adversely affect their lives also, and vice-versa. Mine areas often have a monochromatic appearance. Coal mining areas are depressingly black, iron ore town are red, ochre lends a yellow colour and limestone makes everything chalky white. Fine particles of the ore spread as a uniform layer of dust on every available surface in these areas. The pervasiveness of dust is the strongest indication that mining is not a benign activity. Unless it is carefully planned and thoughtfully carried out, it can barren the land, pollute water, denude forests, defile the air and degrade the quality of life for people who live and work in the vicinity. Modern technology has enormously magnified our ability to extract minerals. In the process, it has also gravely threatened human lives and the environment. In Jharkhand mining activity ranges from the small, completely manual stone quarries to mechanical mines. With increasing mechanization, mining equipment has grown larger and more powerful. Entire landscapes are altered in a relatively short period of time. Mining ruins the land, water, forests and air. The loss or pollution of natural resources degrades the quality of human life in these areas. Increasingly, mineral-based production units like coal-fired power plants, steel plants and cement factories are located near the mines. A cluster of thermal power stations are planned near the major rivers of Jharkhand. A precise estimate of the amount of agricultural land lost to mining is not readily available. Every mining enterprise, however, means the conversion of land to such purposes as roads, railways and ropeways for mineral transport, townships for housing miners and manager, infrastructure for administrative purposes, land for stockyard and preliminary processing operations. In effect, the total land affected by mining is many times larger than the simple lease area. The large scale mining and allied activities going on in the Jharkhand region have caused severe damage to the land resources of the area. Vast areas of rich forests and agricultural land belonging to the indigenous people have been laid waste because of haphazard mining. Eliminating of existing vegetation and alteration of soil profile due to open cast mining operations, including shifting of overburden and reject dumps, have caused severe soil erosion and silting of adjoining courses and degraded the productive capacity of the lands in the area. Excessive underground mining, especially of coal, is causing subsidence of land in many areas as a result of which such lands have been rendered unsafe for habitation, agriculture and grazing. In 1980´s the coal mining industry became identified as a major cause of damage to the environment, with more than 80 sq. kms. of land being destroyed every year. Damage to land can also result from underground and stockyard fires in coal mining areas. Coal is normally accompanied by methane gas which is released when the coal is fractured and crushed during production. This gas can ignite spontaneously and it is extremely difficult to stop an underground coal seam from burning once it ignites. The normal practice is to seal off the tunnels where the fire has started so that it is starved of oxygen. This process may take years. In the Jharia coalfields, an underground fire has raged for more than 70 years, covering more than 2000 hectares, and has reportedly consumed 40 million tones of coking coal. The Website of the Jharkhand government says that forests in Jharkhand cover about 29 per cent of the state´s total geographical area. Feeding minerals to meet the nation´s insatiable appetite has taken its tall on the state- rampant mining for decades has turned large tracts of forests into wastelands. During the 80´s, coal companies acquired thousands of hectares of forests in Jharkhand for mining operation in Damodar valley. In Singhbhum district a similar devastation of forest lands happened for extracting iron ore. According to the Forest Survey of India´s State of Forest Report, during an assessment published in 1997, Jharkhand had 2.6 million ha of forest. In 1999, it had 2.2 million ha, a loss of 0.4 million ha of forest cover. The forest cover in the Damodar valley coalfield, once 65 per cent, stands at only 0.05 per cent today. Saranda, once so dense that even the sun´s rays couldn´t penetrate it, has Asia´s largest sal (Shorea robusta) forests and is an important elephant habitat. Today, uncontrolled mining for iron ore, both legal and illegal, is destroying not just the forest, but also the wildlife, apart from the livelihoods of the local tribal communities. The impact on the forests has been significant. According to the state of forest reports, between 1997 and 1999, about 3,200 ha of forest was lost in the Singhbhum region. Between 2001 and 2003 some 7,900 ha of dense forests were lost in the East and West Singhbhum districts. Saranda too has been affected, and further degradation will have serious consequences for its considerable biodiversity. It is now established that much of the groundwater pollution is caused by human activities, especially mining. Mining wastes pollute streams and rivers. Ore fines and toxic substances carried by rain water into nearby water courses, alters their chemistry and often makes the water unfit for human use. By locating mineral treatment facilities near the mines, water pollution problems get worse. These units use enormous quantities of water for washing the ores. The untreated effluents, slimes or tailings are often released into neighbouring streams or lakes. In many cases, the latter are the sources of water supply to the population. The large scale mining operations going on in the region have adversely affected groundwater table in many areas with the result that yield of water from the wells of adjoining villages has drastically reduced. Further, effluents discharged from mine sites have seriously polluted the streams and under groundwater of the area. Acid mine drainage, liquid effluents from coal handling plants, colliery workshops and mine sites and suspended solids from coal washeries have caused serious water pollution in the region, adversely affecting fish and aquatic life. Damodar and Subernrekha river valley are the cradle of industrialization in Chotanagpur plateau region. Damodar is the most polluted amongst Indian rivers and ironically almost all polluting industries are government owned. About 130 million litre of industrial effluents and 65 million litre of untreated domestic water finds way to Damodar drainage system every day. A study of the area showed that one coal washery alone was discharging about 45 tonnes of fine coal into the Damodar every day and there are as many as eleven coal washeries in the region with an installed capacity of 20.52 million tones annually. Today the picture of Damodar or Damuda, considered a sacred river by the local tribals, is quite like a sewage canal shrunken and filled with filth and rubbish, emanating obnoxious odors. Other major rivers of the region are also seriously polluted. The Karo river in the West Singhbhum is polluted with red oxide from the iron ore mines of Noamundi, Gua and Chiria. The Subernrekha shows a different type of pollution which is even more hazardous in nature. Metallic and dissolved toxic wastes from TISCO, Jamshedpur and HCL Ghatsila and radioactive wastes from the uranium mill and tailings ponds of the uranium corporation of India limited at Jaduguda flow into Subernrekha and its tributaries. The release of different toxic metals like arsenic, mercury, chromium, nickel etc. from the coals and mine spoil heaps in Damodar and its tributaries have caused severe damage to water quality. Continuous dewatering by underground mines also affects water resources. These mines annually pump out millions of litres to drain mine galleries and release it into nearby water courses. This has caused flooding, silting, water logging and pollution in the mining areas of Jharkhand. They have also reduced the surrounding water table, and also reduced the available groundwater. Mineral dust is a pervasive feature of all mining areas. It is generated by wind sweeping dust from water heaps, blasting and the use of heavy machinery. Blasting also produces noxious fumes that are released into the atmosphere. Air pollution in the mining areas in Jharkhand state has caused respiratory diseases and eye ailments. According to the report published in the citizen´s report by Centre for Science and Environment, New Delhi in 1984-85, the Roro asbestos is dumped into the open which has endangered not only the lives of the mine workers but also of those living in the surrounding areas. Dust generated by mining and mineral based industries has also reduced agricultural productivity in Jharkhand State. The metal content in fly ash goes on increasing with decrease in particle size. This observations have been found to have conformable behaviours in the fly ash study of Damodar coals. In exclusive coal mining areas also high incidence of pneumoconiosis, up to 11%, has been reported in the Jharia coal field region. Roro hills is located about 20 kilometers west of Chaibasa, the district headquarters of West Singhbum, Jharkhand. The region has had an active history of mining operations for about seven decades starting with the mining of magnetite. 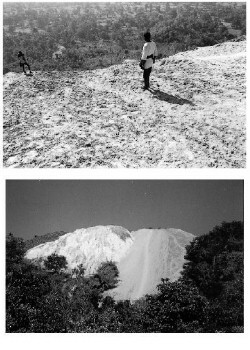 Roro hills were mined for chromite and asbestos by major industrial houses like Tatas and Birlas. This hill range is contiguous to Jojohatu hill which is also mineralized with chromite. TISCO, which used to mine chromite from Roro, stopped operations before 1958 as they struck better deposits elsewhere. Asbestos mining was started by Hyderabad Asbestos Cement Products Ltd. after the area was abandoned by Tatas and Kesri, who were mining magnetite and chromite. The highest elevation of the Roro hill is approximately 600 meters above the level of the plains where the settlements of Roro and Tilasud village are located. The entire hill range is well wooded. Interview with ex-workers from the Roro mines from Roro and Tilaisud villages revealed that most of them had suffered or are suffering from low back pains, blindness or severely reduced vision, and respiratory illnesses. Several of those interviewed complained of coughing blood in sputum. FFT examined three chest radiographs (taken between 1998 and 2000) of workers who complained of chest pain and respiratory distress. The chest radiographs revealed several radio-opaque opacities in the middle and lower lobes of both lungs. These suggest some form of interstitial lung disease (pneumoconioses, pulmonary tuberculosis as comorbid conditions). Physical examinations were not carried out. Most patients described their conditions as tuberculosis but given their occupational histories, pneumoconiosis as either the principal diagnosis or a co morbid condition cannot be ruled out and merits further investigation. Several workers with history of working in the asbestos mines complained of low back pain. One worker, who had worked at the pumping station for over 10 years was suffering from epigastric hernia These findings suggest presence of ergonomic musculoskeletal disorders. Several workers complained of significantly diminished visions. Some had cataracts, and evidence of eye injuries. A few workers complained of deafness subsequent to their exposure to loud sounds in the mines – reportedly secondary to exposure to loud noise with no protection of ears during blasting operations. The dominant mining companies of the world are now showing great interest in India, especially in the Jharkhand region. The entire Jharkhand area, rich in minerals, will now throw open for plunder and loot by these vested interests. With the expansion of the mining activities, land degradation, air, water and noise pollution will attain alarming proportions. This will have serious economic impact upon the villages and their agrarian population. The existing agricultural and forests land will shrink further with the eventual emergence of more wastelands. More and more indigenous people will be forced to move out of their hearths and homes to brick kilns, stone quarries, etc. in search of livelihood. Their wealth will be forcibly taken away from them leaving behind heartbreak, destruction and degradation. The author will like to exhort different political leaders and the prominent individuals of Jharkhand to set up an environmental army and demand that industrial planning in the area must be weighed against the prospective loss of environment and the existing industrial establishment must conform to WHO standards for treatment effluxes and to ILO standards of workplace environments. Areeparampil, M.SJ. (!995). Displacement due to mining in Jharkhand, in Mining Environment, B.D. Bhagat and D.N. Thakur (Eds. ), Oxford & IBH Publishing Co. Pvt. Ltd., New Delhi. Singh, J. (1985), Upper Damodar Valley: A study in Settlement Geography, Inter-India Publication, New Delhi. Citizens report- Rich lands and poor people (2008), Centre for Science and Environment, New Delhi.